This problem was common from introduction of the column lock to this day. Almost always it is caused by the lock plunger binding in the recess of the steering shaft. The immediate fix is to hold moderate pressure on the key trying to rotate it to the point where it would normally be removed while moving the steering wheel back and forth. Once the key has been rotated it can be withdrawn. The other possibility is that the lock tumbler assembly has just worn out. In that case you have to remove the column lock for replacement. Beyond that I will tell you that when I was in the dealer system and this began to occur on almost new cars the factory freaked out about the possibility of law suits due to what they saw as a possibility of the lock activating itself going down the road and locking the steering. That WOULD have been a bummer, but I never heard of it happening. Anyway, they sent all of the dealers a box of small aluminum plates all fixed up and formed to fit between the lock plunger and the opening in the column house. This POSITIVELY eliminated any chance of the plunger springing up and engaging the recess in the steering shaft. We had to recall EVERY B and Spridget that we had sold to that time that had a column lock and install one of these things in every car on the lot. Needless to say the effort made a real impression on me. Remove the three large bolts above the driver's knees holding the column assembly to the body structure. Remove the two Phillips machine screws from either side of the column shroud. Press down on the steering wheel with considerable force in order to reveal two more screws, one on each side of the shroud that are hidden by the lower part of the dash. I actually use a LONG Phillips screw driver, about 15", so that I can get nearly a straight shot at the screw head rather than a stubby driver that would have to go in at a sharp angle. Slip the shroud off over the column switches. It CAN be done without removing any of them. Looking from the top down you will see the upper strap of the column lock held on by what appears to be perfectly flat screws. Use a sharp punch or an awl and a medium sized hammer to work these screws counter clockwise. You will have to make contact and dig in at several points around the perimeter of the head as you do this as there is precious little room to swing the hammer at the right angle. Once unscrewed enough though you can use a pair of pliers to finish their withdrawal. Once the screws are removed the top strap will stay in place and the bottom business end of the lock will fall away. Now look directly up from beneath the column and you will see the opening that I was speaking of earlier. Use some tin snips to cut a rectangular section out of a tin can and try to form it as a "band-aid" to cover the opening. I suggest that you use a thin gauge aluminum can as it will deform easier and allow the protrusion of the lock body to fit up in the case. Lay it aside for the moment. Once the patch is formed go attack the lock. Do what you have to do with lock lubricant to make sure that it rotates smoothly. If it is really jambed up or will not work no matter what you do, it will have to be replaced, but in most instances the application of some light oil and/or graphite onto the key and repeated insertion and withdrawals will make everybody happy again. When you are satisfied with the lock operation you can do an installation in the reverse order of disassembly with the exception that you are going to put just a dab of some sort of glue, rubber cement will do, just something, to hold the plate in place over the plunger of the lock for a few moments while you install it. If you are using a new lock it will come with shear bolts. These are bolts with a very tapered section designed to break off at a certain torque and produce the smooth surface that you encountered when you took the thing apart. I recommend that you NOT break them off, just to make it a little easier if you have to remove the lock for any other reason in the future. They were made like that to add some more deterrent to a car thief if he tried to remove the column lock. 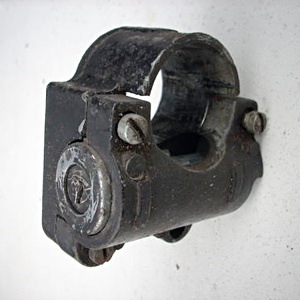 If you are re-using the old lock take the two screws over to a bench vise and hold them by their heads while you use a hack saw to make a cut directly across the head sufficiently wide and deep to accept one of your straight blade screw drivers. When done you can use these to do the re-installation. Lift the lock carefully into place and hold it firmly there with your left hand while you position the top strap and begin to screw the fasteners into place with your right. Work from one side to another in order to make sure everything comes together squarely. On most models there is a very small dimple and pimple on the column and lock that helps positively position the assembly. If yours is so equipped make sure that they have engaged. After securing the fasteners to your satisfaction try working the lock and ignition several times to make sure you are happy with it before you replace the shroud and bolt the column back up. One more thing. If your lock was worn out it could be caused by having too many keys or other junk on your key ring. The weight of all of that stuff jingling up and down as you go down the road puts LOTS of stress on the key and tumblers. If you don't believe me try gripping your ignition key with your finger tips and jumping it up and down. Lots' of effort to hold on isn't it? This use to happen to Mercedes a lot and when those locks when it took a genuine act of God to get the lock assemblies out. HUNDREDS of dollars! Comments on "Fixing The MGB Steering Column Lock"
Thanks Jack. Just acquired a 1977 Roadster and no sooner did I get it home to play with it when the key jammed up. Now to clean up the ignition wiring! I am having problems removing the steering column cowling. I don't know if all the screws are there. What size are they? Where are they located?, etc. I've had problems with my Ignition switch and would like to get in there and see what's up.